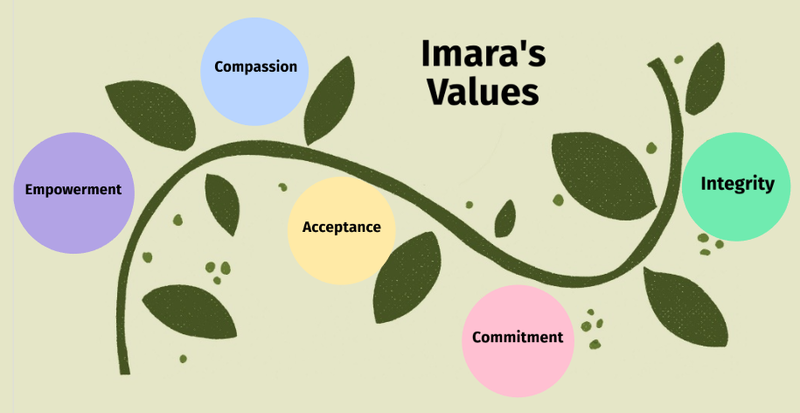 Our five values are Empowerment, Acceptance, Commitment, Compassion and Integrity. We encourage empowerment by discovering and honouring our own and others' resources, to create independence and hope, enabling others and ourselves to flourish and moves forwards. We embrace acceptance by actively listening to others in an open-minded way, acknowledging their past, present and future, and honouring abilities, qualities and achievements. We do this to create an environment where all feel respected and respectful and individuality is celebrated. We actively demonstrate commitment by holding our clients in mind and doing whatever we can to promote our cause, being consistent even in the face of adversity. We do this to create positive working relationships, trust, and to deliver a high quality service. We show compassion by being thoughtful about what others may be experiencing and responding to them with kindness. We seek to understand the impact of experiences and realities on behaviours and empathise with others. We do this to help others and ourselves feel heard, valued and understood, and to meet the future positively whilst being at ease with oneself. We embrace integrity by dealing directly with others even when it is challenging, and by not concealing or hiding uncomfortable realities. We do this to promote oppenness and honesty throughout our work.